May 26: Mojave remembered the the fallen on this Memorial Day, in the Mojave Cemetery. 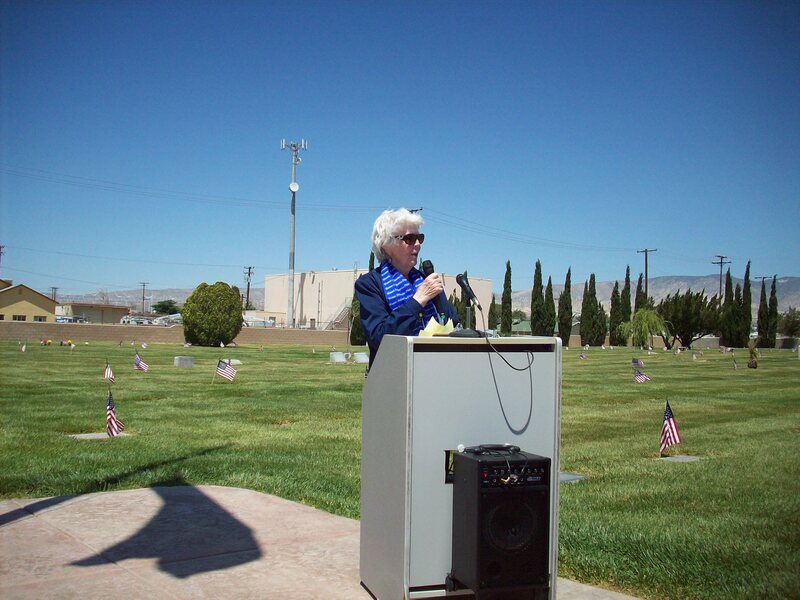 The event was organized by Mojave’s own Cathy Hansen, and featured speakers Doug Clipperton, of the Mojave Chamber of Commerce, Flora Belle Reece, who transported fighter planes across the country in WWII, and Captain Todd Quelet, a Civil Affairs Officer and veteran of Afghanistan. Mr. Clipperton described the sacrifices that that his father endured as a B-17 pilot in WWII, and the hundreds of pilots lost in service to their cause. Ms Reece described the events of Pearl Harbor through the eyes of Admiral Nimitz, and despite the thousands of lives lost, how the United States emerged from that tragedy with remarkable luck, perseverance and determination. This entry was posted in Army, Community events, Memorial Day, Mojave CA, Selfless Service, Veterans on May 27, 2014 by mojavefoundation. One of the very best Memorial Day events I have been to in many yearsWhat a wonderful job by all those involved.